Providing home cooked meals to people that you love is such a simple, yet meaningful way to show that you that you’re there for them. Ever since I was little, my mom would set a good example by making home cooked meals for friends and family who were having children or dealing with grief. It was such a great way to teach us girls a way to care for others but also how to cook. This past weekend was another one of those moments when another family was in need of some good home cooked love. We are at a loss at how to show the family that they are loved. 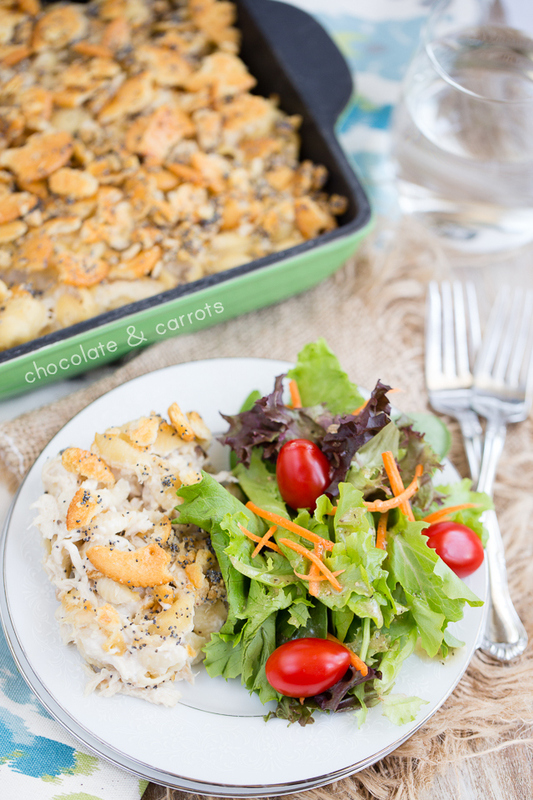 I think this Poppy Seed Chicken Casserole is a good start. 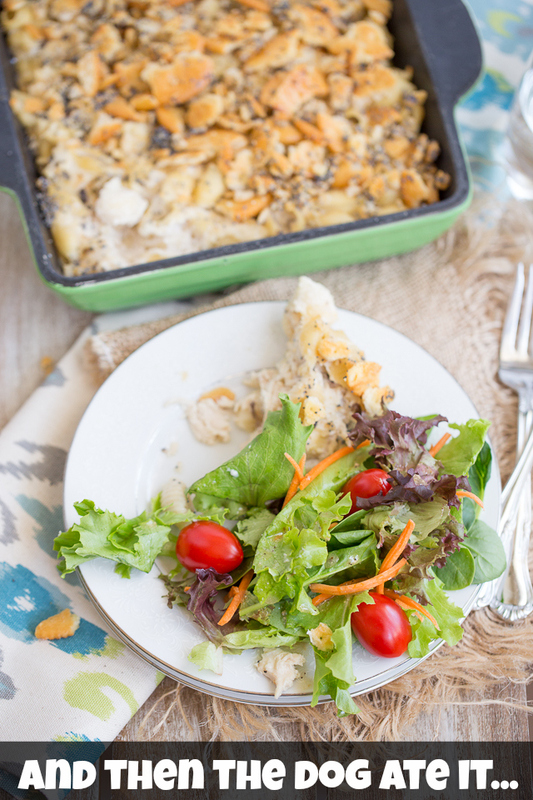 When sending this casserole to friends and family, we always send in disposable bakeware along with a fresh salad and dessert. A complete meal that will warm their tummies. And since this is Chocolate & Carrots where I always try and make things healthier, I adapted the recipe my mom always makes and made it that much better for you without loosing the flavor. The casserole is creamy and filling, with bites of the crunchy topping in every bite. The perfect way to show someone you care. I hope to share with Liam the ways I’ve learned to show people we care as he grows up. In the meantime, I’m thankful that during the little bit of down time we have during the day, I can put on television shows on Netflix Instant Stream that also instill good messages like helping friends. Every moment is a teaching moment…and they’re all so precious. Side Note: As I was mid-photoshoot of this casserole, Liam climbed out of his crib and my mom was watching the food. Simultaneously, my mom got the heartbreaking news while I was attending to Liam. Meanwhile, my mom’s dog Lily spotted the casserole set up by the back door and enjoyed a few servings of the casserole…but we found out she doesn’t like salad. Cook the pasta according to the packaged directions and drain. Meanwhile, in a pot of boiling water, boil the chicken breasts until cooked through. Remove from the water and shred. Mix the pasta, shredded chicken, soup, greek yogurt, chicken broth, salt and pepper together. Pour into a 9 x 13 inch casserole dish. Mix the melted butter, crushed Ritz crackers and poppy seeds together. Sprinkle over the casserole. Bake for 45 minutes or until bubbly. This post was sponsored by Netflix Stream Team. I received non-monetary compensation for this post. All opinions are my own. This post also contains an affiliate link where a small percentage of purchases goes toward supporting my site. Please read my disclosure policy for further information. I am sorry those around you are hurting. 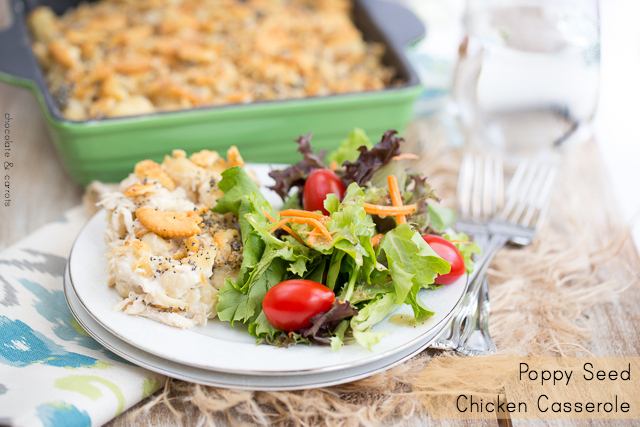 This casserole sounds delicious and certainly would be a wonderful dish to bring to those who could use it. Cooking is the way I tell others I care too. p.s. Between my toddler son and dog I have had photo shoots ruined by both of those drool buckets Not a lick of patience between the two of them!